In some of my previous posts, i had compared two of the most awesome browsers available on the internet, i.e. Chrome and Firefox. But now, it seems to me that there are a very few reasons left to even compare both of these browsers. Chrome has come a far-far away from Firefox, the features, speed, user statistics, everything says it all. Here are a few things I have to show how chrome has become better than firefox in the recent past. I googled out the recent browser statistics just to check out how popular the browsers have been recently. Here is a data for the months of June and July 2011 that show a quite clear picture regarding their popularity. This data shows that Chrome has become more popular among the users than Firefox(overall). 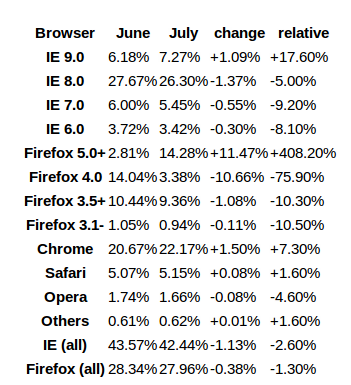 It has a relative increase of 7.30% from the month of June to July while Firefox (overall) has a decrease of 1.30% in case of usability. Recently there have been severe browser wars, Firefox continously released a lot of its versions one after another what i have mentioned in one of my previous posts (Mozilla Firefox: Download the latest versions). Even Chrome has been evolving quite frequently. There have been comparisons all over the internet, whats better, firefox or chrome. Even I had compared them in one of my posts (Firefox 8 Vs. Chrome 15). But one thing what i mentioned was “Firefox might feel fast, but Chrome is fast”. Chrome actually uses WebKit for rendering Web pages, the same rendering engine as Safari, which is known to be very fast. One of its awesomest features is its own task manager. Chrome treats tabbed windows as separate processes. Not just this, Chrome also has a nifty way to see what’s going on: a task manager. Similar to the task manager in Windows, it lets you see which processes are active (inside Chrome), and how much memory, CPU, and network resources they use. Beautiful. You can access it by right clicking Chrome’s title bar. Chrome has recently proved all of it, it has evolved with a lot of its newer versions nad still in progress. World might be talking about Firefox these days but Chrome is in real what everyone thinks Firefox is. I had been a great fan of Firefox ever since i dumped internet explorer. You can say Firefox has been a bridge from internet explorer to Chrome. Best thing about chrome is its quite simpler GUI, which has a lot of stuff under the hood. If you are a big fan of Firefox and you dont't prefer any browser else than Firefox, you should surely read this article. Now, I am going to show you what Chrome has been evolving and what new Chrome has got for you. 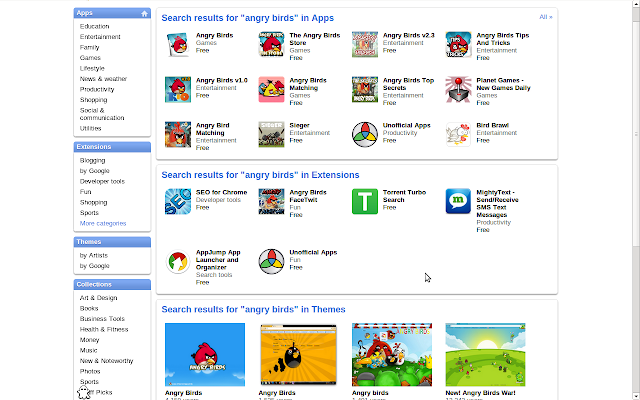 This is Chrome web store what you see in the image above. I don't feel I need to describe much about it, the image says it all. 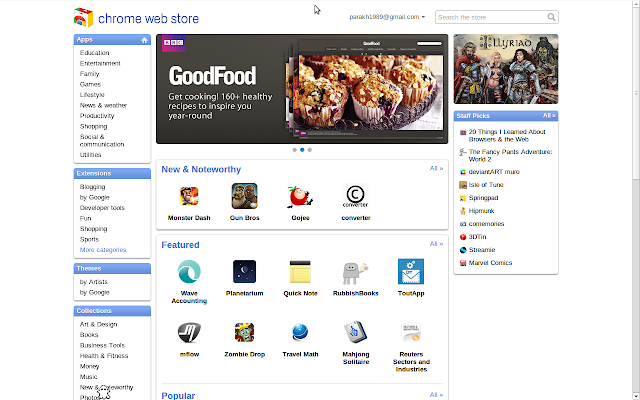 Web store has an awesome collection of internet and browser apps, has awesomest themes for Chrome you might have never used or seen for Firefox. It has everything, every possible stuff for your entertainment. All the games you have loved, mario, angry birds and much more. I have both Chromium and Chrome installed in my Ubuntu machine,and also have the latest unstable Firefox nightly. I feel the difference while i use them and so will you. Check this out, this is your all time favourite and super addictive game of all times, Angry birds. Chrome web store has a games from Angry birds. Well, its not really easy to switch from the browser you have been working from quite long to some new browser. 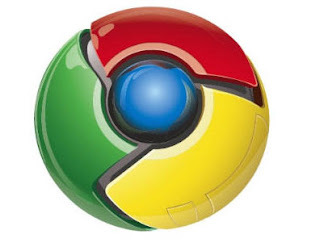 I was pleased to see that Google Chrome was built with this in mind; for example, it’s easy to switch from Firefox, but it does bring enough novelties to make you stick around. Importing your bookmarks from Firefox is easy and works well; and other details, like keyboard shortcuts, are the same. Therefore, Chrome’s learning curve is virtually non-existent; start it up and you’ll be browsing as usual in no time. Oh, really, --- I can't even get chrome to read a pdf document -- despite hours of fiddling. Just not ready for prime time. Chrome handles PDF files fine....it has for a long time. Open 20 tabs in Chrome and 20 tabs in Firefox. You will know what is wrong with Chrome and why Firefox is better or way better than Chrome. - The chrome web store might be great, but they cannot match the wide choice of powerful and indispensible plugins and addons for Firefox. Yes, the 20 tabs stuff is quite ok for firefox but don't you see one thing, firefox is there from longer than what chrome has been and considering that chrome is doing real better than firefox. I agree, Chrome has been my #1 browser for the past 3 months or so. I seldom use FF nowadays, but sometimes a site actually doesn't work in Chrome...and there are some dev tools in FF I use. Ofcourse Toob.... nothing is perfect, things are made perfect with tym...!! this post is bogus!! surely the writer is a noob......!! First, chrome has a loophole that it doesn't have master password feature!! Second,don't u get me started on the plugins and addon thingy..FF is way awesome than chrome!! And a word of advice for chrome lovers speed is not everything stability and performance matters...and someone made a point that FF has been around for more time than chrome...well if u r comparing with one of the best( probably the best browser ever) dont give such lame excuses! !